The Wall Street Journal's latest analysis of the housing market has Houston as the hottest housing market in the country out of 27 major metros. We are one of only three markets where homes are still going up in value, and we have the lowest inventory increase (a sign of housing weakness) and the strongest employment outlook. Despite that, they spend more space talking about Seattle and Charlotte, and their paragraph on Houston is accurate but kind of lame. Houston's market is benefiting from job growth at energy and technology companies and draws newcomers because of its low home prices. The median price in the second quarter was $152,700, compared with a national median of $227,500, according to the National Association of Realtors. Something about Blogger makes the graphic table below not very readable, but if you click on it, it will load in its own browser window and be more readable. Business Week also has a recent article on the national housing bust (thanks to Erik for the link). Their point is that many markets weakening now can be expected to bounce back strongly over time if history is any guide. Their graphics (one, two) are not very hot on Houston, because, well, we allow plenty of new construction and competition to keep prices in check. But their text is a little more positive, and it makes some very good points near the end. How do you know if your own local market is the kind that will snap back or the kind that will languish indefinitely? One key factor is the ease or difficulty of building new homes. Places where new home construction is a long and expensive process, such as Boston and San Francisco, tend to experience big price movements, both up and down. "Restricted supply leads to more volatility in prices," says Edward L. Glaeser, a Harvard University economist who has studied big-city housing markets. Glaeser isn't ready to predict where prices are headed market by market, but the cities with tight housing do usually boom again after a bust. In places such as Atlanta and Houston, by contrast, price cycles are usually mild, because the supply of housing is flexible. Traditionally, flexible markets have gone through booms and busts only when there was a wrenching change in demand, such as during the oil-patch roller-coaster of the 1980s. Looking at the supply side's effect on boom-and-bust behavior isn't the usual way of assessing housing prices. The more common approach is to determine, by measures such as price-to-income ratios, which markets seem to be overvalued and which undervalued, and then assume they will converge toward fair value. Moody's Economy.com Inc. (MCO ) has a projection of house prices out to 2015 that shows most of the biggest 10-year gains in apparently cheap markets such as Pittsburgh, Nashville, Houston, St. Louis, and Austin. Economy.com's approach is consistent with textbook economics. But it would have done a bad job of predicting what happened in the past 10 years, wherein the pricey got pricier and the cheap cheaper. For example, even though Houston has had a long stretch of healthy growth, it's so easy to build homes there that inflation-adjusted prices are still 19% below their 1983 peak. In an era of globalization, cities with international reputations can get an edge over blander neighbors if they're perceived as scarce commodities. For example, Nashville, as the capital of country music, has at least the potential to convert its fame into wealth, says Gleb L. Nechayev, an economist at Boston-based Torto Wheaton Research, a unit of CB Richard Ellis. Miami developers have parlayed the city's international fame into booming sales of condos to Latin Americans and Europeans. But while the uniqueness phenomenon may help growth in those cities, it won't necessarily keep prices up, because it's easy to build: Witness the current glut of Miami condos. What makes the housing supply inflexible in markets like Boston isn't necessarily a lack of land. Far more often, the cause is regulatory constraints like minimum lot sizes. "There's a pretty strong correlation between volatility [of housing prices] and regulatory constraint," says Stephen Malpezzi, a housing economist at the University of Wisconsin School of Business. Glaeser says that because of zoning regulations, the density of housing in many metro Boston communities is actually lower than in growing areas of the supposedly wide-open Southwest. "In Wellesley [Mass. ], they should be building apartment buildings around the train stations, but it's all single-family housing," says Richard K. Green, a finance professor at George Washington University. At this stage in the slump, restricting the supply of housing may sound like a good thing. It's not. Sure, it can make current owners richer by increasing the scarcity value of their homes. But it's murder on first-time buyers. And in the long run, it's bad for the local economy. As Glaeser notes, companies tend to migrate away from areas with costly housing to avoid paying the higher salaries needed to compensate employees for their home costs. He notes that between 2003 and 2005, high-cost Massachusetts lost 0.3% of its population, more than any other state. "The economy cannot grow unless the population grows, and the population cannot grow without new housing," he wrote in a May paper. Houston placed very nicely in a couple lists I came across this weekend. First, in Industry Week magazine, Houston was ranked #1 in the Southwest for manufacturing with 222,477 jobs, well ahead of all competitors, even if you combine Dallas and Fort Worth. When it comes to ranking southwestern U.S. cities by the number of their manufacturing jobs, the "Big D" must yield to Houston for No. 1. Manufacturing employment in Houston totals 222,477, nearly twice the 121,073 manufacturing jobs in Dallas, according to data assembled by Manufacturers' New Inc., an Evanston, Ill.-based directory publisher. So we're not only the Greenest City in the Southwest, we're also the Industrial Capital of the Southwest. The second was a short list in this weekend's Wall Street Journal of Zagat "Power Scene" restaurants in a selection of 10 cities, with their "high-profile clientele and high food ratings." Mark's American Cuisine in Houston not only tied several restaurants on the list with the top score of 28 out of 30, but it did it at a much lower cost than any other city on the list. I don't consider $55 to be a cheap meal by any means, but it is compared to the other places on this list. As I've mentioned before (twice), Houston is an amazing restaurant town. According to Zagat, we eat out much more often and at a lower average price than the rest of the nation. Dining Out More, For Less: Perhaps the most impressive finding from Texas-area Zagat surveyors is the fact that Texans in Austin, Dallas/Ft. Worth and Houston dine out more frequently than denizens of any other major U.S. city–and by a large margin. Zagat Survey results show diners in Austin and Dallas/Ft. Worth average 4.0 meals out per week–25% more than the national average of 3.2 meals per week–while diners in Houston (4.2 times per week) beat the national average by over 30%. By comparison, Bostonians dine out a mere 2.7 times per week and New Yorkers 3.4 times per week. In addition, the average cost of a Texas meal is $28.67, well below the national average of $32.06. Below, a selection of restaurants noted for their high-profile clientele and high food ratings. They were chosen by Zagat Survey based on Zagat's surveys of diners. Notes: Food ratings are on a scale from 0 to 30. Price is surveyors' estimate of the cost of dinner with one drink and tip. I usually assume my readers catch stories in the Chronicle (which is why I don't pass them along too often), but I want to make sure you catch a couple stories this morning. The first is the formal announcement of the Greater Houston Partnership's $40m Opportunity Houston campaign lead by Astros owner Drayton McLane, something I talked about a while back. They've raised $14m of the $40m and seem confident they can raise the rest. It's an ambitious program that could really take the Houston economy to the next level. Targeted industries include aviation and aerospace, energy and petrochemical, medical and biotechnology, information technology and nanotechnology. If HOV/HOT lane expansion is considered (usually from one to two lanes), I think most spoke freeways in Houston would be better off with two lanes going one direction than one lane in each direction ("better off" meaning more demand and making more money). The contra-flow direction is rarely problematic on most Houston spoke freeways, the exception being the I10 Katy, but they already have a 4-lane tolled solution under construction for it. Two same-direction lanes would also allow passing, which is always helpful. Go all EZ-tag like the Westpark tollway. The buses and vanpools need to be free, but I think you need to charge for all other vehicles, including high-occupancy cars - otherwise you have to have human intervention counting which cars have enough people to avoid the tolls. Studies have shown that most HOV riders are related family members that would have ridden together anyway (spouses or parents with children), so they're not doing much to change behavior and really encourage carpooling - those riders are just getting a free perk. Tolling all cars is not only much simpler and makes more money, but it also encourages bigger carpools to split the fare among more riders. Right now, once you have your 2 or 3 riders, you're done, but if everybody pays the toll, you now have a strong incentive to fill that minivan/SUV if you can and make it as cheap as possible for each person. Reason's eminent transportation expert Bob Poole also advocates this approach. Do real-time pricing like San Diego if you can, where you sense traffic loads and adjust prices on the fly as needed. Otherwise, Mondays, Fridays, traffic accidents, and weather can all send people flocking to the HOV lane and overcrowding it. You just need an electronic sign at the lane entrances telling people how much they're going to be paying if they decide to hop in at that point. It's a great idea that Houston really needs ASAP. The slow, measured approach is the right one with rail, but not this project. Let's hope this one goes on the fast track. A recent issue of Governing magazine has an article on the rise of flexible sidewalks made out of recycled tires. Since just about every sidewalk I've seen in Houston is busted up by the roots of our many wonderful trees, this seems to be a perfect product for our city. And it's a double-win: tires get recycled, and we get better and more durable sidewalks. Unfortunately, they cost more in the short-term, but the long-term savings are impressive. If any of you out there know people at the city's public works department, please forward this over to them. About 50 years ago, arborists in Santa Monica, California, chose ficus trees for the urban landscape. The trees have large canopies that provide shade and oxygen, beautify the city and increase property values. The problem is that little ficus trees grow up to be big ficus trees--with roots that can break up sidewalks and leave the city vulnerable to pedestrian trip-and-fall litigation. Altogether about 60 U.S. municipalities have installed stretches of sidewalk that are flexible and have some spring to them, similar to a rubberized running track. Rubbersidewalks Inc., a California-based manufacturer, has put its product through a battery of tests. They've been shoveled, sanded and salted, and subjected to high heels, oil, acid, coffee, bicyclists, children, chalk and paint. The company has safety-tested them for people on skates, in wagons, with walkers, on crutches and on bikes. Gum, tree sap, berries and pollen can be hosed off or steam cleaned. Initially, the cost for rubberized sidewalks is much higher than concrete. The 100-foot stretch in New Rochelle cost $8,000. Concrete would have cost $3,000. A lot of that has to do with the expense ofshipping the heavy material from the factory in California, and cities buying just a few pieces, rather than in volume. The company is planning a second factory for New York State and thinks that if the sidewalks take off, the prices will come down. But even at the higher initial prices, the equation changes in a few years when compared with the cost of having to remove and re-pour concrete. "After three years," Valeriano says, "we're not just breaking even, we're ahead of the game." Update: Metro and Houston Parks and Recreation get onboard. Not sure if this is related to my request for forwarding, but if so, thanks! The Milken Institute recently released a study (full report pdf) on university technology transfer and commercialization, with a particular focus on biotech. It includes several interesting rankings. The news is mixed. Unfortunately, Houston as a city didn't do so well, but Rice did extremely well, and Baylor College of Medicine and the University of Texas system were also recognized and did well in certain categories. Rice University ranks within the top 10 in three of our innovation pipeline measure. It is the top school for patents filed per million dollars of Research Expenditures and patents filed per Invention Disclosure; and ranks ninth, as shown in the table below, for the number of Startups per Million Dollars of Research Expenditures. Nila Bhakuni, Director of Rice University’s OTT, attributes the ranking to “the culture and attitude of the managers of this institution who support commercialization, a goal that has been in place since the OTT opened in 1998.” She noted that Rice has had “a very large number of filings” in nanotechnology and that the university’s business, natural sciences and engineering schools have partnered in the “Rice Alliance for Technology and Entrepreneurship,” a program to educate faculty and the Houston business community. Baylor College of Medicine ranked 16th globally on biotech publication, right between Cambridge and Oxford. Not bad company. Houston didn't do as well in their "Tech-Pole" rankings, which they define as "the absorptive capacity of technology transfer within a metropolitan area", placing between 19 and 23 nationally depending on the index. As you might expect, Silicon Valley was #1, although you might be surprised to find Washington DC at #2. The University of Texas system scores first on their Biotech Patent Composite Index. Rice and the Texas Medical Center make a great starting foundation, but we've got a long way to go to be a stronger commercialization center. Hopefully sustained efforts by BioHouston, the Greater Houston Partnership, the Houston Technology Center, and the Rice Alliance will get us there. I've seen amazing progress in just the last ten years. If the upward trendlines are sustained, we should do a whole lot better in future rankings. Tonight is a quick pass-along from Bob Poole's Surface Transportation Innovations newsletter on two different approaches to running managed/high-occupancy-toll lanes, with the benefits of one over the other and Dallas' choice of the better one. I'm not sure what Houston's plan is (starting with the managed lanes down the middle of the new I-10), but we're both in Texas under TXDoT, so I'm assuming it will probably go in a similar direction. What Kind of Managed Lanes? On a number of occasions this year I have given a presentation before transportation groups contrasting two different models for priced managed lanes (whether called HOT lanes or something else. Model 1, as I call it, conceives of the lanes essentially as HOV lanes that sell any excess capacity to paying customers. Their purpose is to maximize ride-sharing, helping to meet the goal of reducing peak-period driving. Model 2, by contrast, conceives of the lanes as congestion-relievers, offering fast, reliable, trips to paying customers, and as incidentally assisting in various transit and ride-sharing goals (e.g., by letting buses and vanpools use the lanes at no charge). California’s two pioneering projects serve as role models. The I-15 HOT lanes in San Diego are a classic Model 1 project, with all net toll revenues dedicated to subsidizing commuter bus service in the corridor. The 91 Express Lanes in Orange County are a classic Model 2 project, offering half-price rates to HOV-3 vehicles but no other freebies. The differences I summarized may not sound like much, but they make an enormous difference. Model 1 projects, because they give top priority to car-pooling, generally let as many HOV-2s as possible use the lanes, even to the point of excluding any paying customers. That’s just what happens in some of the HOT lane feasibility studies I’ve reviewed for several large metro areas recently: precisely at the busiest peak periods, when congestion relief is needed most and people are willing to pay the highest price, the lanes are shown as generating zero revenue, because demand for HOV-2s must be accommodated. It’s this kind of nonsense that leads some to conclude that “HOT lanes can only generate enough revenue to pay for operating and maintenance costs, not for capital costs.” And because building a network of HOT lanes in a large congested urban area would be a multi-billion-dollar effort, it’s clear that as long as Model 1 prevails, we aren’t going to see anything like HOT networks get built. Whereas, we already know that the Model 2 approach in Orange County is paying the entire capital cost of those four new lanes, as will the Model 2 approach being planned for the Washington, DC-area Beltway HOT lanes. I’m pleased to report that the Dallas/Fort Worth metro area has recently adopted a largely Model 2 approach. The North Central Texas Council of Governments developed the draft policy and engaged public and private-sector stakeholders in debate and discussion earlier this year (including a presentation by me in Ft. Worth). You can download the resulting “Managed Lane Policies” by going to www.nctcog.org/trans/committees and clicking first on Regional Transportation Council, then Toll Policies, and then Managed Lanes Policy. The same approach will be used for all managed lanes in the metro area. Each new managed lane will begin with a six-month introductory phase, during which it will operate with a fixed toll rate of up to 75 cents/mile, adjusted monthly. After those initial six months, the pricing will be dynamic (as in San Diego), at whatever rate is needed to manage traffic flow with a minimum average corridor speed of 50 mph. Transit vehicles will go free, and HOV-2s will get a 50% discount during peak hours but pay the full rate other times. The HOV discount will phase out after the region has demonstrated attainment of air-quality goals; at that point, the lanes will become pure Express Toll Lanes (i.e., Model 2). Several other details are worth noting. Once the system goes to dynamic (market-based) pricing, drivers will receive rebates if the average speed drops below 35 mph. And there will be no discounts for “green” vehicles—a proper distinction between transportation finance policy and environmental/energy policy. It’s contemplated that many of these managed lanes will be developed and operated by the private sector under long-term partnership or concession agreements. The policy recognizes that the length of such agreements should permit developers to maximize their potential revenue. It also acknowledges that pricing will be essential to sustain the performance of the lanes, so that “tolls will remain on the managed lanes” after the PPP agreement terminates. This is one of the best managed lanes policy statements I’ve seen. Other Metropolitan Planning Organizations that are looking into HOT lanes and HOT networks should take a careful look at this policy. Time again to clear out the backlog of miscellaneous small items. A post on Reason's blog about a detailed satellite image study saying sprawl hasn't increased since 1976. There is more development, of course, it just isn't any more scattered than it used to be. A census release on household spending for shelter by city. As you would expect, Houston is pretty darn affordable at $8,706 per year on average, or about 18.1% of total household expenditures. We're not the cheapest city, but on a percentage of income basis, we're awfully close. A city of cheap housing and high average salaries = substantial discretionary income = increased city vibrancy. Those "opportunity dollars" fund small business creation and growth/hiring, higher education, charitable giving, and support for restaurants, arts and entertainment amenities. A recent article on changes in commuter behavior, including increasing suburb-to-suburb commutes instead of suburb-to-central-city. That is one of the reasons why commuter rail is a bad idea, but distributed, point-to-point express bus/car/vanpool transit in MaX lanes is a good idea. This is not a political blog, but if you didn't catch Nick Anderson's animated editorial cartoon on Hillary Clinton over at the Chronicle web site, you need to take a look. Nick is an equal-opportunity satirist, and this should be pretty hilarious to both sides. Enjoy the cool weather and have a great weekend. It seems like an appropriate follow-up to my last two posts on the 300 million population milestone in America to cover Joel Kotkin's newest op-ed in the Wall Street Journal on the future, where we're expected to reach 400 million before 2050 (alternate link, permalink on his site). Despite the desires of some new urbanists and "smart growth" activists to cram people into dense cities and regions, the America of 2050 -- contrary to the contention of some demographers -- also will likely be far more dispersed. A combination of new telecommunications technologies and rising land prices will accelerate the shift of population beyond the current suburban fringes and into the countryside. The demographer Wendell Cox calls this "sprawl beyond sprawl." It is driven by the simple fact, according to most recent surveys, that the vast majority of Americans -- upward of 80% -- still prefer single-family homes over apartments, while no more than 10% to 15% want to live near the central core. Unless there is some sort of cultural revolution, most people, particularly families, are likely to continue migrating to places where they can acquire a spot of land and a little privacy. And despite the much ballyhooed "return to the city" by aging boomers, most experts suggest that most are either staying in the suburbs or moving to towns farther out in the hinterland. At least 30% of Americans, according to surveys by the National Association of Realtors and the Fannie Mae Foundation, express the desire to move to the country or a small environment, far more than live there now. The scale of this dispersion depends largely on urban governance. If cities cannot, due to economic or regulatory constraints, provide sufficient job opportunities, people and businesses naturally will flee elsewhere. Other factors, such as preserving family-friendly neighborhoods and stamping out a nascent resurgence in crime, will also be critical. Despite these trends, there is no compelling reason for cities not to continue serving as primary centers of the nation's economic and cultural life. For one thing, 10% to 15% of 400 million is not exactly chopped liver. There will be room for some serious urban infill when you figure another additional 15 million city-dwellers will be added over the next 45 years. The roster of great American cities will continue to evolve. There's little chance that aging industrial cities such as Detroit, Baltimore or Cleveland will regain their former prominence. By the same token, due to their dominance in particular industries, New York (finance and media) and Los Angeles (entertainment and Pacific Rim commerce) are all but certain to remain vibrant, if troubled, super-metropolises. The shift of corporate headquarters and key industries to new cities could catapult more affordable, business-friendly cities such as Houston (energy, inter-American trade and medical care) and even Las Vegas (the global fantasy-factory) into true global centers. Fast growing cities like Phoenix, Charlotte, Dallas, Orlando and San Antonio will also likely become far more important and cosmopolitan. Several factors will accelerate this process. One is the continuing movement of minorities and immigrants into the suburbs, which tend to be less hospitable to the creation of segregated racial enclaves. If you want to find the newest and biggest Chinese supermarkets, Hindu temples, or mosques, the best place to look is not the teeming cities but the outer suburbs of Los Angeles, New York or Houston. Just travel to places where few Manhattan or Washington pundits venture, like Ft. Bend County outside Houston. The largely affordable middle-class suburb has a population that is just under half white, one-fifth African-American, one-fifth Hispanic and around 12% Asian. It's the new American melting pot, and, more or less, it's working. Our population growth certainly indicates belief in the collective American future. But accommodating this surge clearly will require a strong response from both the public and private sectors. Perhaps the most daunting challenge will come not so much from accommodating racial diversity, but dealing with the problem -- existent in virtually all advanced economies -- of class. Over the past two decades, education, global competition and other factors have led to a concentration of wealth. Recent surveys found nearly two-thirds of Americans fear that their children will face longer odds in trying to achieve their dreams. These troubling statistics may lead some to call for shutting down immigration, or adopting European-style redistributive politics. Although immigration and economic policies may need some adjustment, emulating the European welfare state or blockading the border would snuff out the very sources of entrepreneurial energy necessary to meet our future challenges. Instead, we need to deal with the future by doing those things that in the past Americans have done best -- building new infrastructure and giving people the opportunity to take care of themselves and their families. Most major surges of economic growth and population have been facilitated by such investments -- canals in the early 19th century; railroads during the industrial age; roads, bridges and electrification during the Roosevelt, Truman and Eisenhower eras. Today we need to commit ourselves to building both hard and new infrastructure: more universal high-capacity broadband and better drainage systems, new electric transmission lines and renewable energy sources, better roads and innovative forms of public transit. Governments at every level can and should play a critical role in this great project. But we also need to take advantage of the vast pool of private capital available both here and abroad for such investments. Investors can be lured, as in the past, by the opportunities created by a growing nation. Building toll roads or super-fast trains between burgeoning Texan or Californian cities offers far better prospects than doing the same in Japan or Germany, whose populations are gradually diminishing. As Tocqueville noted over 170 years ago, America has flourished not because of geniuses in Washington but due to its Constitution, fertile land mass, egalitarianism, entrepreneurship, unique spiritual vitality and attachment to local community and family. This combination of factors has always made us different from other countries, and, in this deeply cynical and secular age, now more so than ever before. These factors do much to explain why we have reached the 300-million milestone at a time when most of our primary competitors are either stagnating or shrinking. They also provide some reasonable expectation that we will figure out how to accommodate the 400 million Americans living here in the generation ahead. I have to say, my biggest fear these days is not North Korea or Iran or Iraq or terrorism, but that America will follow the path of Europe, where fear drove government protections that squelched dynamic opportunity and lead to a genteel decline of sluggish stagnation (see an excellent "big picture" op-ed here by the newest Nobel Prize-winning economist). Could we do the same out of fear of China, India, and the rest of the rapidly developing world? Let's hope not. 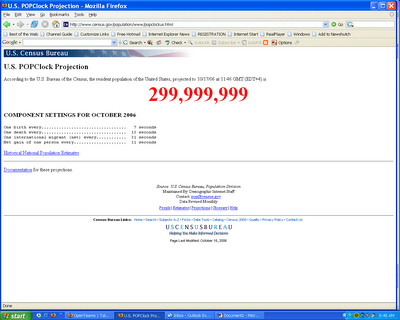 Based on a link from Drudge, I happened to catch the US population clock as it crossed 300 million this morning at 6:46am. Screen shots below. A pretty major milestone in our country's history. It was kind of like watching the New Year's Eve clock hit midnight in '99/2000. I was lucky to get all three screen shots - clearly a lot of people were hitting the web site, and it slowed down and jumped some numbers in the count because of loading delays. My wife Lynn says they covered it live on CNN. There are articles appearing all over the media about America hitting the 300 million population mark this month. My favorite magazine, the prestigious and influential Economist from Britain, chose to build their article on the topic around Houston as their case study. Read the whole thing. It'll make ya proud to be a Houstonian. When Europeans hear the words “America”, “religion” and “family values”, they think of brimstone preachers raging against unconventional domestic arrangements. They often forget the more positive role American churches play in nurturing conventional families. Lakewood's ministries, for example, teach married couples how to communicate better and give them practical advice on how to bring up children and put the family finances in order. In such a mobile society people often have nowhere else to turn for friendly counsel. Hillary Clinton once said that “it takes a village to raise a child.” Often in America “the church is the village,” says Stephen Klineberg, a sociologist at Rice University in Houston. On or around October 17th, according to the Census Bureau's population clock, the number of people in the country will hit 300m, up from 200m in 1967. By as early as 2043, the bureau says, there will be 400m Americans. Such robust growth is unique among rich countries. 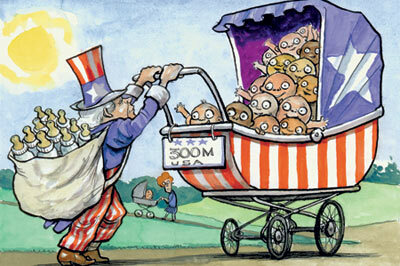 As America adds 100m people over the next four decades, Japan and the EU are expected to lose almost 15m. These are only projections, of course. Lifespans will no doubt continue to stretch and immigration rules may change. What is striking, though, is the gulf between the fertility rate in the United States and other rich countries. American women today can expect to have an average of 2.1 children. That is the number needed to keep a population stable, so observers sometimes take it as a given and say that America's population growth is entirely due to immigration. This obscures the point: for every big advanced country besides America and Israel, the alternative to “replacement rate” fertility is a baby bust. The fertility rate in the EU is 1.47—well below replacement. By 2010, deaths there are expected to start outnumbering births, so from that point immigration will account for more than all its growth. And that average hides countries that have seen an astonishing collapse in the willingness of their citizens to breed. The fertility rate in Italy and Spain is 1.28, which, without immigration, would cause the number of Spaniards and Italians to halve in 42 years. Falling birth rates are linked to prosperity. People in very poor countries tend to have lots of babies because they expect some of them to die in infancy, and because they need help in the fields and someone to care for them in their old age. The fertility rate in Niger and Mali, for example, is over seven children per woman. As countries grow richer and women get educated, they have fewer children and invest more in each one. Whereas peasants in Mali cannot afford not to have kids, many Westerners fret that they cannot afford to have them. University is expensive, and if Mum (or Mom) decides to stay home, the household must forgo the salary she used to earn. Add to this the sudden halt to a life of carefree first-world hedonism, and it is no wonder that birth rates have plummeted in all rich countries. But much less so in America. Why should this be? Religion plays a role, argues Mr Klineberg. Americans are more devout than Europeans, if church attendance is any guide, and their faith colours their worldview. Don Iloff, a spokesman for Lakewood Church (and Victoria Osteen's brother), agrees. Faith begets hope, he says, and if you have hope for the future, you are more likely to want to bring children into the world. Polls certainly suggest that Americans are more optimistic than people in most other countries. Philip Morgan, a sociologist at Duke University, and Miles Taylor, a population expert at the University of North Carolina, cite several other possible factors. Birth rates are lower in more patriarchal rich countries, such as Japan and Italy, than in places where the sexes are more equal, such as America and Scandinavia. Perhaps the knowledge that Dad will help with the housework makes women more willing to have children. America's coastal areas are fairly densely settled, but families who cannot afford a spacious home with a garden in Connecticut or California can move somewhere cheaper. They often do, one reason why the mean centre of America's population—ie, the point at which an imaginary, flat United States would balance if only the people on it weighed anything—keeps moving south and west. In 1800 it was still near the eastern seaboard, in Maryland. By 2000 it was in Phelps County, Missouri, and heading for Oklahoma. Can America cope with a relentlessly expanding population? A look at Houston suggests it can. The city is one of America's fastest-growing. The population of Harris County, which includes Houston, grew by 21% in the 1990s, to 3.4m. The surrounding counties are booming, too. Since Houston has no zoning laws, developers can build wherever they think there will be demand. Rather than waiting for the city to extend sewers and power lines to outlying areas, they can issue bonds to pay for such services themselves, and pass the cost on to the people who buy the houses they build. At the Woodlands, a 28,000-acre (11,300 hectares) planned community north of Houston, you can buy a three-bedroom family home on a quiet wooded street for $130,000. By comparison, the median house price in San Francisco is over $700,000. The Woodlands has good schools, 145 miles (235km) of hiking trails, golf courses designed by the three greatest retired golfers in the world, and a cluster of oil and high-tech firms. It is also safe. “Police salaries are paid by the community, not the county, so we have more of them,” says Roger Galatas, who used to run the Woodlands operating company. The community makes its own rules. Restrictive covenants prevent anyone from uprooting too many trees, or building eyesores. Several houses share each mailbox, so neighbours chat when they pick up the mail. Houston was 70% white in 1960, but is now a mix: 57% white (of which 42% are Hispanic), 24% black and 6% Asian. “Where you grew up is irrelevant in Houston,” says Tim Cisneros, a local architect whose mother came from Mexico. “Everyone is so busy making money they don't have time to worry about race.” Polls suggest that the picture is not quite so rosy—79% of blacks think blacks are “often” discriminated against in Houston. But 69% of Houstonians think the city's ethnic diversity will become a source of strength. It is easier to deal with a globalising world if your citizens have roots in many countries. America's future could look something like Houston's present, argues Joel Kotkin, a writer on demography. As the nation's population surges, it will become more ethnically mixed and especially more Hispanic. Houston suggests that that will be just fine. Rapid growth may cause environmental problems, but it will greatly slow the pace at which America ages. Whereas in the EU by 2050 there will be fewer than two adults of working age for every person over 65, the proportion in America will be less scary, at almost three to one. The problems of growth, says Mr Klineberg, are easier to deal with than the problems of decline. Can the world cope with a relentlessly expanding America? Many non-Americans will shudder at the prospect, but which alternative superpower would they prefer? China? If demography is destiny, they will not have to find out what a Chinese hyperpower looks like: the fertility rate in China is only 1.7, and there are almost no immigrants. Continuing from our last post on Houston's high rankings on the Fortune Global 500, we also recently scored well on another Fortune ranking of the fastest-growing companies. More evidence of the energy boom and its impact on local companies and Houston. HOUSTON – The Houston region scored big on Fortune magazine’s latest ranking of hot companies released today. Of the 100 companies ranked, Houston led the pack with 12 companies on the list. Second place is Irvine, CA, with only four companies on the list. Houston’s total exceeds the combination of these Texas cities: Fort Worth, San Antonio, Irving, Dallas and New Braunfels. It also exceeds the combination of these four cities put together: Irvine, New York City, Atlanta and Phoenix. The 12 Houston-area companies on the list, in order of ranking, include: Vaalco Energy (1); Edge Petroleum (8); Frontier Oil (11); Southwestern Energy (35); Swift Energy (40); Grant Prideco (48); Helix Energy Solutions Group (50); EOG Resources (53); ConocoPhillips (75); National Oilwell Varco (93); Quanex (94) and Oil States International (95). Rankings were based on earnings-per-share growth; revenue growth; and total return. Editor’s note: A complete listing of company rankings can be viewed in the September 18, 2006, edition of Fortune magazine. Fortune magazine recently released their 2006 Global 500 corporate rankings with a very cool graphic that is unfortunately not online. It's an abstract map of the world, with circles for each country proportional in size to the Global 500 revenues of companies based in that country. Then, within the circles, were the names of the cities in that country with Global 500 HQs, with larger font names for those cities with more Global 500 HQ revenues. Of course, the U.S. is the largest circle by far, followed by good sized circles for Britain, France, Germany, and Japan. You can see the city rankings here, with Houston in a very respectable 10th place globally, with almost $327 billion in Global 500 revenues. The top four you can probably guess, each with Global 500 revenues over a trillion dollars: Tokyo, Paris, London, and New York (the classic Big 4 world class cities). Houston is third in the U.S., but you'll never guess who's #2 (8th globally). It's Irving, TX, home of mega-corp Exxon. As a matter of fact, poor Dallas (#203) is in a smaller font on the map than Houston, Irving, Plano, Ft. Worth, San Antonio, and Round Rock. Dallas has a single Global 500 to Houston's six, although obviously the DFW metro does much better. You'll also have a hard time guessing #4 U.S. (#11 global): Bentonville, AR, home of Wal-Mart. Surprisingly, Chicago, whose metro barely beats us for #2 on the domestic Fortune 500 HQs, is way, way down at #43 on the global list. There is also an alternate ranking by number of HQs rather than revenue, where we move up to a 4-way tie for 9th place globally, tied with Atlanta for 2nd place in the U.S. with six. Obviously, because of the energy industry, Houston stacks up extremely well. What's impressive is that our rankings are so high even without counting many Global 500 companies with major operations here, but not their HQ: Exxon, BP, Shell, Chevron, HP, etc. So my next thought after reviewing this list/map is what major Global 500 business cities are we not yet connected to by nonstop flights? You can check out Continental's route maps here. We have the Big 4 covered (Tokyo, Paris, London, NYC), although we're stuck with remote London Gatwick instead of close-in Heathrow because of arcane regulations. The top ones we're missing are Beijing, Munich, and Seoul (The Hague is drivable from Amsterdam). China routes are pretty tightly controlled, so I doubt we'll see that one until the U.S. negotiates open skies with China. Lufthansa does run a hub out of Munich in addition to Frankfurt, so that's a possibility. And Continental SkyTeam partner Korean Air hubs out of Seoul, so we're likely to see that one in the not-to-distant future. Finishing out the top 15 cities, Zurich, Madrid, and Brussels seem like longshots. I think Continental is pretty content running those connections through Newark. But overall, we're in pretty good shape - both a top global business city and pretty well connected to other top global business cities, including almost all the ones in North America. That's long enough for today. Thursday night I'll post on another Fortune ranking win for Houston. Otis and I don't always agree, but on this topic we do. This post from his Urban Notebook blog at Governing magazine really succinctly sums up the problems with schemes like California's Prop 13 that excessively cap property tax appraisals. This is not to say reasonable growth limits on local government spending - like Houston has now and is voting on again this fall - are a bad idea. Those restrain government spending without the market distortions seen elsewhere. When a city gets "hot" and property values shoot up, it's too easy for politicians to spend the windfall rather than uniformly lowering the property tax rate. One item he overlooks: having a solid property tax (as opposed to too low and/or relying more on other taxes, like sales or income) incentivizes owners of valuable but idle land to do something with it, thus increasing the vitality of the city. They face a cash drain the longer they hold onto it without developing it into a use the community values and is willing to pay for. You can find some of my previous thoughts on tax caps in this post, which also contains links to other posts I've made on the topic. As usual with Otis' blog, no permalinks, so here's the entire post. It’s time to call these mindless property tax-limitation schemes what they are: a libertarian version of rent control. Here’s the irony: Like rent control, they end up punishing the ones they were intended to benefit. And along the way, they throttle cities. How are property tax limitations like rent control? Let us count the ways. First, they’re aimed at a particular, politically powerful group: homeowners in the case of tax limitations, urban renters for rent control. Second, they shower subsidies on these groups. Tax limitations do so by sticking others with the tax bill (commercial property owners, renters, second-home folks, new homeowners, etc. ), rent control by taking money from landlords. Third, like all subsidies, tax limitations and rent control create distortions in the marketplace. By subsidizing some renters, rent control forces landlords to do things they wouldn’t otherwise do. Some find ways of pushing out longtime tenants, since the longer a person has lived in a rent-controlled building, the less he pays as a rule. This defies the usual logic of the marketplace, which is that businesses love longtime customers. Other distortions: It forces owners to turn apartments into condos, even if they’d rather be in the rental business. And seeing what a lousy business renting is, developers don’t build new apartment buildings. End result: The supply of apartments grows so tight that it traps families in units they’ve outgrown (they can’t afford to move to more suitable apartments) and newcomers can’t find places to live. Something similar happens with property tax limitations and the housing market. As with rent control, tax limitations tend to benefit longtime homeowners, and therefore trap them in their homes. Even if an older couple would like to downsize by moving to a condo or townhouse, they can’t. They’d lose their tax benefits. And newcomers, who have to pay for the tax breaks of longtime residents, often can’t afford the high taxes that come with home purchases. Under tax-limitation schemes, governments are loath to allow new housing to be built. Reason: Localities hold out for land uses that pay their way, such as offices, apartments, industrial and retail. In time, then, communities come to the conclusion that they just can’t afford any more homeowners. Final way tax-limitation schemes are like rent control: They make housing scarce and, therefore, unaffordable. It’s no accident that the nine of the 10 worst markets for housing affordability are in California, home of Proposition 13. Rising fast on the unaffordability lists: Florida, which has had a brain-dead tax limitation scheme called “Save Our Homes” since 1992. This kooky law hasn’t saved any homes; it has simply made them unaffordable. In the end, then, homeowners as a group do not benefit any more from these tax-limitation schemes than do renters under rent control. Oh, a fairly small group does: People content to stay in one apartment or house for decade after decade. For them, the rewards of rent control or tax limitations are huge, and they are fiercely protective of their subsidies. But just about everyone else loses, including cities. Newcomers and young people are the lifeblood of communities. By rewarding a small group of old-timers — indeed, by cementing them in place — we make it harder to attract the ones we need the most. Continuing our ongoing quest at Houston Strategies to help shape a strong branding identity for Houston (why brand a city?, history/list, latest), this week I had a simple insight: people have noted that Houston, because of our tropical climate, is one of the most lush and green cities around, especially if you can get an elevated view (see David Crossley's "Green City, Garden City" initiative). I've personally noted and heard others mention the slightly depressing brown tinge in most of the rest of the dry Southwestern U.S., especially in the winter. Houston could legitimately claim to be the "Greenest City in the Southwest", and year-round at that. Playing on the double-meaning of the word "green", it could also support all of the Mayor's different environmental initiatives. It's a simple, short, powerful, compelling image for the city that helps neutralize many of our negatives, and one that could be woven into all sorts of communications, advertising, and marketing - from the Partnership to the Convention and Visitors Bureau to local companies trying to recruit employees. Came across this interesting article from USA Today on how airports are looking for new sources of revenue. Houston is prominently featured (excerpts below), and the article also has a section on DFW real estate development and gas drilling. Denver: 34,000 acres, largest in the U.S. I've been there, and they're not kidding - it's massive. Wikipedia says they have space for 12 (!) runways. IAH's long-term master plan calls for 7, up from 5 today, which should be more than enough for the forseeable future - although I'll bet they could squeeze in an 8th or 9th if it became necessary. About a year ago, officials from Houston Bush Intercontinental airport huddled to tackle a persistent conundrum — how to squeeze more money out of its 12,000 acres of land. As part of an ongoing effort by the airport to increase non-aviation revenue, officials thought the land, which needed constant maintenance, could be put to more productive use. From that meeting came Houston's latest money-making idea having nothing to do with airplanes or airline passengers: cutting and baling the grass on airport land and selling it as hay to cattle ranchers. The city-owned airport formally launched its agricultural program this month by cutting some of the wild grass on its land. Sales generated a modest $30,000. But the airport will broaden the program by sowing 2,000 acres later this year with Tifton 85 Bermuda, a protein-rich grass favored by livestock growers. "The general sense in the business is that airlines are going to have ups and downs," says Richard Vacar, director of Houston Airport System. "And we're trying to find other sources of revenue so that we don't fully depend on airlines, particularly in a downturn." The Houston hay venture typifies a growing trend in airport management: looking beyond traditional aviation-related sources to bolster finances. Airports' increasing participation in entrepreneurial activities has raised some questions about how much risk a government should undertake. A failed enterprise by an airport has the potential to backfire on local government. Losses could lead to a lower bond rating or even a bailout. Houston now has an indirect ownership stake in an airport in Ecuador that came about from its foray into selling consulting services to foreign airports. But officials there took steps to insulate the city from risks associated with the venture. In 2001, Houston formed an affiliate company, HAS Development, to market the airport's consulting and training services to foreign airports. It brings in about $1 million annually for the Houston Airport System. The company trains airport managers from developing countries on a wide range of issues, including safety standards, running a fire department and management practices. One of its early projects was consulting Ecuador's Quito Mariscal Sucre International for its concessions program. After the government's privatization of the airport, HAS and its financial partners now manage the airport. HAS owns a 25% stake in Mariscal Sucre. The government is building an airport to replace Mariscal Sucre, to be open in four years. HAS and its partners will continue to operate the new airport. HAS is also looking to buy stakes in other foreign airport complexes. Houston's Vacar says he doesn't believe the city airport system is taking undue risk by venturing into airports in developing countries. As a separate non-profit corporate entity, HAS Development shields the airport system and the city from liabilities, he says. Paula Hochstetler, president of trade group Airport Consultants Council, says assessing risk will be increasingly important as airports begin to broaden their businesses beyond the traditional functions. As public agencies, airports should stick to businesses that pose little risk to the local governments that own them, she says. "They have to be deliberate and have good business sense that it doesn't place the airport in jeopardy." I knew HAS provided consulting to airports in other countries, but this was the most detail I've come across on that arrangement. I guess we should be proud we have an airport system so well run other countries want to know how we do it. Time again for the quarterly highlights post. These posts have been chosen with a particular focus on significant ideas I'd like to see kept alive for discussion and action, and they're mainly targeted at new readers who want to get caught up with a quick overview of the Houston Strategies landscape. Managed competition for Houston city services? 2005 Highlights can be found here.